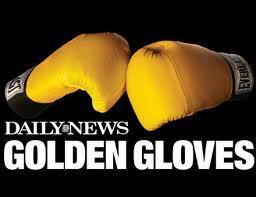 REMINDER: New York City’s own 84th annual Daily News 2011 Golden Gloves Finals! The Golden Gloves finals will be on April 7 & April 8 @ the Madison Square Garden Theater! Come on out for two great nights of fighting — no doubt you’ll be watching some future Olympians and world champions! The fight roster is listed here. For more information on tickets click here. You can also contact Gleason’s Gym. They’ve set aside a nice block of tickets and still have some available, but you’ve got to act fast! Call (718) 797-2872 or email info@gleasonsgym.net. >>>>PS: Nice piece in 4/6/11’s Daily News here. 84th Annual Daily News 2011 Golden Gloves Finals: April 7 & April 8 @ Madison Square Garden Theater! 84th Annual Daily News 2011 Golden Gloves Semi-Finals Week Ten Reminder! 3/23/2011 – K2 Boxing Club – Queens Crossing Mall, Mundan Banquet Hall, 136-17 39th Avenue, 2nd Floor, Flushing, NY 11354, 7:30 PM Start. For Tickets, contact K2 Boxing Club, 718-361-5252 or email Jane@k2boxing.com, Featuring: 132 lb. Open, 165 lb. Open, 112 lb. Women, 132 lb. Women. 3/24/2011 – Blessed Sacrament Church, 198 Euclid Avenue, Brooklyn, NY 11208, Featuring: 178 lb. Open, 201+ lb. Novice, 123 lb. Novice, 165 lb. Novice. 3/25/2011 – Empire Raceway Casino, 800 Yonkers Avenue, Yonkers, NY 10704, 7:30 PM Start. Tickets available at entrance to event only. Featuring: 141 lb. Novice, 201+ lb. Open, 178 lb. Novice, and the following FINAL BOUTS! 108 lb. Novice – FINALS BOUT, 176 lb. Women – FINALS BOUT, 176+ lb. Women – FINALS BOUT. And get ready for the Finals to be held at the Theater @ Madison Square Garden on Thursday April 7th & Friday April 8th, 7:00 PM start! 84th Annual Daily News 2011 Golden Gloves Quarter-Finals & Semi-Finals Week Nine Reminder! AP’s Tim Dahlberg has a feature piece out about Christy Martin and her upcoming bout against Dakota Stone on the undercard of the March 12, 2011 Showtime PPV Cotto-Mayorga fight. “Ask promoter Bob Arum and he’ll tell you the biggest problem with women’s boxing is that men don’t particularly like to see women hitting each other, and women like it even less. Though the sport has a small dedicated fan base, women in the ring are generally treated as a side show by fans and boxing promoters.” This article is really worth the read here. Sonya “The Scholar” Lamonakis upcoming bout reminder! As a reminder, the other great women’s bout on March 12, 2011 will pit WIBA #1 ranked U. S. Heavyweight, Sonya “The Scholar” Lamonakis (3-0, 1-KO) against Tanzee Daniels (4-0, 1-KO) on the undercard of HBO’s Martinez-Dzinziruk fight to be broadcast live from Foxwoods. Tickets can be purchased online here or by calling the MGM Grand at Foxwoods at 1-866-646-0609, or in person at the MGM Grand at Foxwoods box office. You can also contact Sonya Lamonakis for ticket information by calling Gleason’s Gym @ 718-797-2872. 84th Annual Daily News 2011 Golden Gloves Week Six reminder: Women’s bouts! 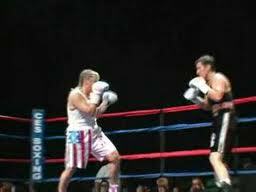 At the aptly named, Justice Sotomayer Center on Wednesday night, February 23rd, the first women’s preliminary boxing bouts of the year will be held across several weight classes. For the uninitiated, the sport of boxing has become associated with violence of all kinds including domestic violence against women. Boxers know that contrary to its reputation, the discipline and work ethic associated with the sport often curtails the kind of personal explosive outbursts of violence that have come to be associated with it. That’s not to say that all boxers are necessarily non-violent, but it does mean that boxers are for the most part practitioners of the art of the sweet violence and abhor violence outside of the ring. The exceptions are heartbreaking and the suicide of Venezuelan boxer Edwin Valero last April after confessing to murdering his wife is no exception. Enter Sergio “Maravilla” Martinez to take on the cause of domestic violence against women. Martinez (46-2-2, 25 KO) who is fighting @ Foxwoods on March 12th in his much anticipated HBO main event fight against Sergei Dzinziruk (37-0, 23 KO) used the opportunity of his recent press conference to talk again about the cause he took up in the wake of the Valero suicide saying, “violence against women is simply unacceptable.” Bleacher Report has a piece about his efforts here. 84th Annual Daily News 2011 Golden Gloves Week Five reminder! For more information and to check on any changes due to weather, please click here. Women’s boxing results plus a Daily News Golden Gloves week four reminder. 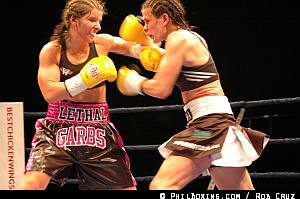 Philboxing.com is reporting that this weekend’s title rematch between Lindsay “Lethal” Garbatt (6-3-1) and challenger Jelena Mrdjenovich (26-6-1) for the WIBA Super Featherweight championship took the fight of the night status and is the kind of match that *should* be on a PPV undercard. Garbatt won the fight with a unanimous decision (95-95, 96-95 and 96-94). Through ten rounds of hard boxing at the WCP Superbrawl held in Barrie, ON, Canada, both women reportedly boxed their hearts out. Writer Rob Cruz compared the fight to the “female version of the Israel Vazquez vs. Rafael Marquez war in the ring.” Click here for the full story. WBAN has an article and terrific photos of the fight here. 84th Annual Daily News 2011 Golden Gloves Week Four bout reminder!